Be the first to share your favorite memory, photo or story of Alice Ida. This memorial page is dedicated for family, friends and future generations to celebrate the life of their loved one. 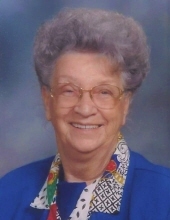 Alice Ida Roberts Stoneking, age 92, formerly of Noble County and Cambridge, Ohio, passed away peacefully November 23, 2018, with her family by her side. The daughter of Richard and Ann Andrews, Alice was born January 2, 1926, in Northampton, England. She married her husband, Bill, in 1943, and moved to the United States the following year. They were married for 27 years until his untimely death in 1970. This union produced four sons. In 1974, she married her second husband, Charles Stoneking, and she was blessed with three step-children. Before retiring in 1991, Alice served in public health services for 30 years, which included the Noble County Health Department and Caldwell Schools. After retirement, she continued her medical career by volunteering at Southeastern Ohio Regional Medical Center in Cambridge. Alice was a very faith driven person and was active in her church. She taught Sunday School for nearly 40 years. She also served her community as secretary/treasurer for the Council on Aging, as secretary for the building committee for the health building, and as a board member for T.B. and Health Association and the Cancer Society. Along with her late husband Charles in 1976, she designed the Noble County flag as part of the Bicentennial celebration. She is survived by Michael (Patti) Roberts, William Roberts, Diana Roberts, Bernard (Becky) Roberts, and Bill (Ruth Ellen) Stoneking; and numerous grandchildren and great-grandchildren. She is preceded in death by William Roberts, Charles Stoneking, Richard "Butch" Roberts, Joyce Daughtery, and Janet Stoneking, as well as her siblings in England. Friends may call Monday, November 26, 2018, from 11AM-1PM at McVay-Perkins Funeral Home, 416 East Street, Caldwell, where the funeral service will follow visitation at 1PM with Ken Perkins officiating. Burial will follow at Halleys' Ridge Cemetery. In lieu of flowers, memorial contributions in Alice's memory may be made to the Central Ohio Hospice, P.O. Box 430, Newark, Ohio, 43058. The family would like to thank the staff of Brookdale Senior Living Center for the excellent care Alice received while a resident there. To plant a tree in memory of Alice Ida Roberts Stoneking, please visit our Tribute Store. "Email Address" would like to share the life celebration of Alice Ida Roberts Stoneking. Click on the "link" to go to share a favorite memory or leave a condolence message for the family.